That’s an impossible question to answer, because there are so many subcategories. Best could mean most high-profile, most nervous, most excited, most emotional, most embarrassing…. And I realized I had the answer. For at least two people on the planet, I had a moment that truly blew their minds, that made me the most amazing person they had ever watched on any screen anywhere, ever. I was hosting Breakfast Television together with Tara McCool at the time. Amazing woman. The kindest, warmest person on earth. And she has three amazing kids. Who hated me. Or at least the oldest two did. Okay, that’s not true. They didn’t hate me, specifically. They hated what I represented. They were maybe six and four at the time. And whenever I’d meet them, I used to try to get them to smile, make them laugh – you know, impress them. But the problem was pretty clear. They had a firm rule in their house: the only TV that was on in the morning was Breakfast Television. Or none at all. Usually none at all. Now I like to think we did some pretty great work at making that show entertaining, but when you’re a kid, the only thing Breakfast Television means is you’re not watching cartoons. And they blamed me for that. So yeah, they hated me. I was in Disneyland for something, maybe the opening of a ride? A movie? Something? I forget. Doesn’t matter. The Disney people had brought probably 40 morning shows from around North America to do their morning show live from Disneyland. It’s a machine that only a company the size and organizational skill of Disney can pull off. They set up about eight stages beside each other with the background of the Matterhorn and Tinkerbell’s Castle. They had satellite trucks set up, and every show was given a few five-minute windows every hour throughout the morning. Then, you wait until your time window, they say “go,” you jump up on stage and they bring you some Hollywood celebrity to talk to. They parade these celebrities from little stage to little stage like a factory. And the magic of it all is that no matter what city you’re in, when you tune into your local Breakfast Show, it looks like your host has the whole park to themselves and that they are just hanging out at Disney with some big celebrities. You don’t realize there are hundreds of people there from 40 mornings shows, all doing the same thing, talking to the same people. So there I was. I talked to, hmmm, maybe David Hasselhoff for my first interview? Then, I think David Hyde Pierce? Not sure. But then it happened. It’s time for my next segment and they don’t have the celebrity ready to go. The couldn’t find them. Disney people are running around, assuring me, “Don’t worry. Don’t worry.” Okay, I’m on my mark, I put in my earpiece, Tara McCool is in Calgary, and I hear her say, “Okay, let’s go back to Disneyland and see what’s up with Dave Kelly.” The light comes on, they point to me and I say, “Hi Tara. Wow, what a time I’m having here and what a beautiful day and blah blah blah…” I start yammering because I have no one to talk to. And then I feel a tap on my shoulder and a voice saying, “Oh hello… you must be Dave” and I turn around, and there she is. The most famous royalty on earth. The biggest celebrity I’ve ever met. Snow White. And we talked about life, love, poison, whistling while we work, all of it. And then it hit me. I was handed the greatest opportunity of my life. 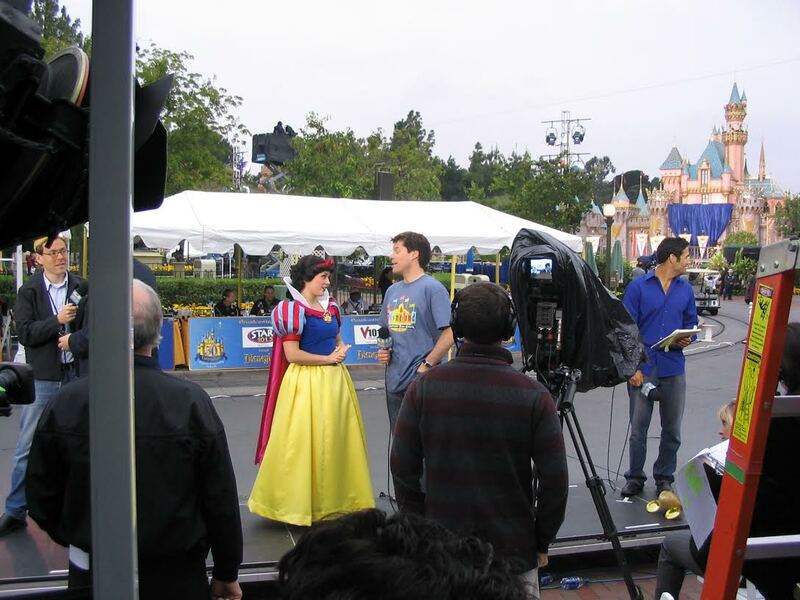 Okay, let’s cut to Tara’s house, where Kevin (Tara’s husband) is feeding the kids, getting them ready for the day, Breakfast Television playing in the background and suddenly there I am, in Disneyland, talking to SNOW WHITE!!! They don’t know what to do with themselves. They hear Snow White say sure. The kids are paralyzed. They don’t know what to do. The Frosted Flakes slowly drop out of their mouths. Then they scream. So there you have it Jess. The most impressive moment of my TV life. At least for Ava and Indya. I’ll try to beat it at Dave Kelly Live, but Snow White isn’t answering my calls.